Not long after I started listening to jazz in the late 60's, I began to hear some of the first ECM records. (Chick Corea's "Piano Improvisations Vols. 1 and 2", and Keith Jarret's "Facing You"). Here was a place where some of my favorite musicians were able to present their music in a new atmosphere, Gary Burton, Paul Motion, Paul Bley, Steve Swallow, Jack DeJohnette, Don Cherry, Dave Holland, Charlie Haden, The Art Ensemble of Chicago, Kenny Wheeler, Dewey Redman and so many others. ECM set a new standard. You knew you were getting something special- the sound of the recording, the performance, the vinyl seemed thicker, that green label looked cool, the covers...Every aspect seemed to be a step up. Back then it was beyond my wildest dreams that I'd have the chance to play on "any" record, let alone something on ECM. In 1978, Michael Gibbs (who had been one of my teachers at the Berklee College of music) asked me to do a two week tour with his band in England. In the band were Charlie Mariano, Kenny Wheeler, Gordon Beck, John Marshall, Eberhard Weber and many others. Every night there was a space that featured Eberhard and myself in a duet. We were really connecting in a great way. The music was really taking off. Soon after the tour ended Eberhard had a recording scheduled and asked me to play on it. This was "Fluid Rustle" with Gary Burton (one of my biggest heros). So, here was where I met Manfred Eicher for the first time. I was so terrified and inexperienced in the studio. The record came out great but I don't think I made nuch of an impression on anyone at that point. It would be a few years before we'd meet again. In 1981, Paul Motion was looking for a guitar player. Pat Metheny recommended me and we've benn playing together ever since. Playing with Paul has turned out to be one of the most important and inspiring relationships in my life. Around this time I had sent a tape of some solo guitar things I was working on to Eberhard Weber. He played it for Manfred Eicher and then Manford must have talked to Arild Anderson and Jan Garbarek about it. Lots of things started happening all at once. I did my first European tour with Paul Motion in the winter of '81. At the end of the tour we recorded "Psalm", and I flew directly from this recording in Germany to Oslo to meet Jan Garbarek for the first time and record "Paths, Prints". Mandeville: Playing in Paul's band I was really encouraged and gained a lot of confidence to find my own voice. It felt like Paul didn't just want a guitar player. He wanted me. Anything was possible. The atmosphere was really "up" at this session. Manfred and all the musicians were so excited and happy to be doing what we were doing. In Line: This piece is from the very first record under my only name. The orfinal idea for me to do a solo recording. At that point I was still pretty intimidated being in the studio (especially alone) and wasn't able to follow through with this plan. I recorded this piece and a few others alone and then came back a few months later and did some duets with Arild Anderson. Sing Song: This piece is from the second record I made with Jan Garbarek. The recording was done after quite a bit of touring. We played in the U.S. and in Europe, especially in Norway. Even though we had been playing a lot live, Jan didn't allow us any of the new music untill we go into the studio. He wanted the music to take shape for the first time as we were recording it. I was really impressed by that kind of courage. Introduction, India: This is from the first recording with Paul Motion's Trio with Joe Lovano, made during our first European tour. This group has turned out to be one of the most rewarding, inspiring musical and personal situations I've ever been in- and one of the longest lasting. Paul writes some of the most beautiful, simple, perfect melodies I've ever heard. "Introduction" is one of them. Resistor, Tone, Music I Heard: This was the first time I'd recorded all my own music with other musicians. With Manfred's help I put together a dream group of players. We had never played together as a group before and have never since. Maybe someday. Al Foster was originally going to be the drummer for this recording and at the very last minute he was unable to do it. I was in a real panic and called up Paul Motion to confide in him. During that period Paul was strongly commited to playing only his own music and was not doing any "sideman" work, so I was very surprised and happy when he offered to play. He really made this music happen and brought it together like he always does. Closer: I chose this piece not for what I played as a soloist but for the way the quartet sounds as an ensemble. I've always loved Clara Bley's songs. This was the first time I'd ever played with John Surman and Paul Bly. We later went on to do a long tour of Europe and the Caribbean and did another recording., "Paul Bley Quartet". Most of our live concerts were improvised from beginning to end. As a guitar player, I find the piano probably the most instrument to play with. It's so easy for things to clash harmonically. You have to be so careful not to get in each other's way, tiptoeing around all the time. With Paul Bley you don't have to consider any of this. Everything seems to work. Lonesome, Alien Prints, Hangdog: These pieces are from "Lookout for Hope". I put this group together around the time my daughter Monica was born, in 1985. It's my first band and this was our first recording. Kermit, Joey and Hank are some of my best friends and it was with them that I gained the confidence to start writing and performing my own music. This was also the first recording I did with Lee Townsend as a producer. "Lonesome" is one of those tunes that one might associate with some kind of "Americana" thing (whatever that is). People say this has come into my playing in recent years. I think it's been there all along. "Alien Prints" I dedicated to D. Sharpe, an incrdible musician and one of my closet friends who passed away shortly before this recording. Kind of Gentle, by Kenny Wheeler: What a graet combination of people. We had all played together in other contexts, but never in this combination. I had played with Dave a little before this, but I felt like we really connected on this recording. Kenny wrote some great music. Sub Rose, by Gavin Bryars: This is the only piece of music that I chose that I didn't either write myself or play on. The first time I met Gavin Bryars was in a Indian restaurant somewhere in England. He handed me some headphones and said "Listen to this". It was a performance of this piece that he had based on my recording of "Throughout" from "In Line". He had transcribed what I had written and played, taken that and developed, abstracted, deconstructed and orchestrated it all in this fantastic way. I sometimes have dreams of music like this. It was so inspiring to hear what could be done with one of my simple tunes and showed me the possibilites for what I might strive for in my own writing. 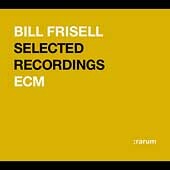 Even though I haven't recorded for ECM under my own name for quite a while, so much of what I do is still touched by it. So many people I now work with came from here. Bob Hurwitz runs Nonesuch Records where I now record. Thomas Stowsand is my European agent. Hans Wendl has worked as my manager and now handles all of my publishing. Lee Townsend is my manager and produces most of my records. I met them all at ECM. I've been so lucky and have had so much encouragement from so many people, helping to get my own music out there. I've been at the right place at the right time many times. I'm so greatful to Manfred Eicher and ECM for being such a big part of it.